After a lot of weeks working hard (even 11,5 hours per day) to release our new product at work, I was destroyed. And by chance I got the unique opportunity of hosting 2 Korean professional baduk (Go) players. They where just the fresh air I needed! Lee Minjin (5p, 25 y.o.) and Park Sohyun (2p, 21 y.o.) arrived to Barcelona on a summer sunny Tuesday, and stayed for a week. I met them on Thursday, when our local Go teacher, Lluís Oh, organized some simultaneous games. 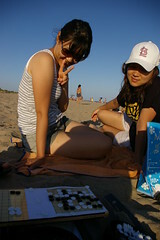 I played against Sohyun, but I made so many mistakes… my mind was too tired from work. I resigned. Despite they are professional players, they are “normal” girls, down-to-earth, funny but incredible smart. And pretty, I should add. I thought they were not interested in speaking about “work” (Go) all the time, because they were on holidays. But I placed a Go board in a visible place of the house, just in case. I was going to host them just for 2 days, but when they saw the hammock on my terrace, they changed their minds and asked for a longer stay… how could I say “no”? – After the simultaneous games, we went to a tapas bar. Somebody brought a Go board and a game between two locals started. At one point, one of the players started to ask for help: he didn’t remember a joseki, and didn’t want to leave a bad impression to Minjin, who was next to us looking at the game. – Playing at home on DragonGoServer, they had a look at my moves… how can I play with 2 pros looking at me?! In one game I started a weird joseki, and my opponent wrote “take care, now I have a joseki book”. My answer was: “YOU take care, I have 2 pros at home”. – One evening they were too tired, and decided to stay at home. I went out to meet some friends, and when I came back home… what a surprise! they were playing with my board, without asking me for permission, haha. They were playing a friendly match, and Sohyun decided to let Minjin start a big ko, despite it looked like she was winning by a little. A couples of ko threats generated another big ko in other part of the board. And I was there, standing up, speechless, like a statue watching the seasons. They reviewed the game at lightning speed, moving the stones on the board, as if they were born for this (actually that’s true). – We went to the beach one evening, and I took with me a magnetic board. Minjin found my way to convert the 19×19 board to a 9×9 one interesting (I just have a piece of paper as frame), and offered me a game. An even game. And, after a ko, I won! Of course it was not a serious game for her, and I used a lot of thinking time, but hey! who can say “I’ve beaten a pro at 9×9″? ^___^ Later she told me I could be 7 dan pro, hehe. The register of the game. – At night she took revenge on the normal board. 5 stones of handicap. It was a really interesting game. Playing with a pro is always an incredible experience, but playing in your own home, relaxed and calm, has NO price. I loved the way of her moves, so calm and relaxed. She didn’t clearly threat any of my groups; subtle but firm. I lost by 15 points. Here you have the register of the game and some of her comments. “Don’t be afraid” she told me… as if I could be careless against a pro. – I asked them about their “job”. Despite they love playing baduk (Go), it’s a stressing way to pay the bills. Their income depends on their results in tournaments, and there is a lot of pressure. It sounds like a “normal” job to me. For some days, my house was full of jokes and an incredible good mood. They filled up the house and my soul. The experience was huge, but the emptiness they left in my house was even more huge. The echo of the room drills my heart. The average level of my lonely house went down again to European 2 kyu. I should go to Korea soon!